Left Over or Leftover – What’s the Difference? Home » Left Over or Leftover – What’s the Difference? One of the perks of being single is that you are only cooking for one, so, most of the time, you will have plenty of extra food that you can save for a quick meal at a later time. There is a word in English for this type of food: leftovers. But did you know that leftover can also be used as an adjective? You can also use the words separately, to form left over. There are subtle differences regarding when each version of the term is appropriate, though, which as a strong writer, you will need to know. What is the Difference Between Left Over and Leftover? In this article, I will compare leftover vs. left over. I will use each word in at least one example sentence, so you can see it in context. Plus, I will show you a helpful memory tool that you can use to make choosing leftover or left over a bit easier. What does left over mean? Left over is an adjective phrase. It describes something that remains after something. We have plenty of pizza left over if you’d like some after your basketball game tonight. If we have paint left over from the living room, we will use it to touch up the walls in the dining room. What does leftover mean? Leftover is an adjective, as well. It has the same meaning as left over, but there are differences in how each term fits into a sentence. Left over is always used after a verb—that is to say, in the predicate of the sentence. You will notice that left over comes after the verb in both of the example sentences in the previous section. Leftover, though, is used before a noun. You will remember that adjectives modify nouns. Leftover usually comes directly before the noun it modifies, like leftover pancakes. I’m not convinced we built this bookshelf correctly, because we have seven leftover screws. If we have leftover flour, we should freeze it so that it does not become infested with weevils. Leftover can also be a noun, where it is usually pluralized to leftovers. Leftovers refer to food that has not been eaten and is being saved for later. It can be tricky to remember when to use which version of this term. After all, they are both adjectives and they both mean the same thing. The only difference is where each appears in sentences. Leftover is usually used directly before the noun it modifies. Left over is used after a verb. Since left over is two words with three total syllables, just like the phrase after verbs, you should always be able to remember that left over comes after verbs. If you are ever stuck deciding, default to the single-word leftover. Leftover is used in the vast majority of everyday uses. Is it leftover or left over? 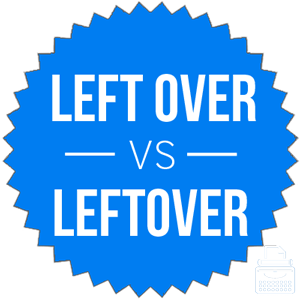 Left over and leftover are two version of the same term, which means remaining or not yet used as an adjective. Left over comes after verbs in sentences. Leftover comes before the noun it modifies. Leftover can also be a noun, where it refers to food that has not been eaten. 1 What is the Difference Between Left Over and Leftover? Anyplace or Any place – Which is Correct? Touch Base or Touch Bases – What’s the Difference?